A handsome oil painting on canvas in its original Arts and Crafts era frame, this artwork was created circa 1910. 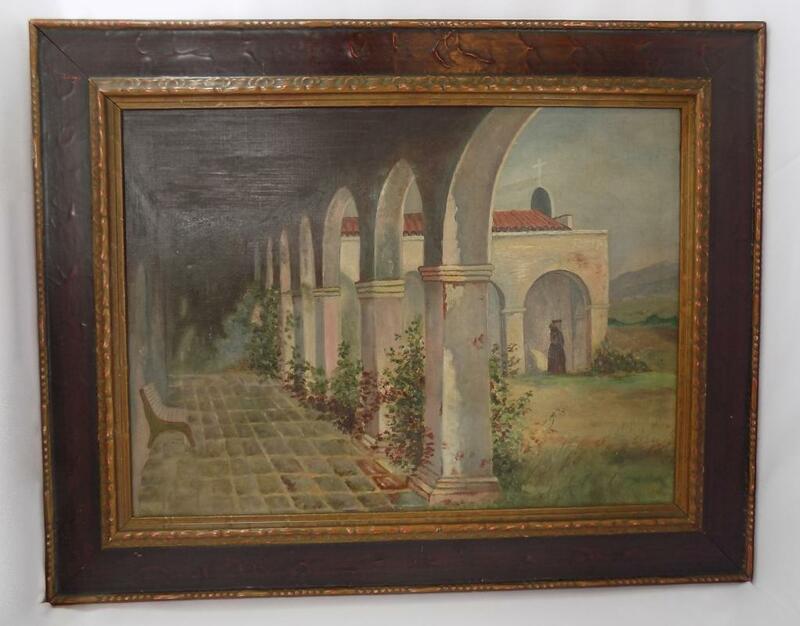 It depicts the Mission San Juan Capistrano in California, built by native Americans and Spanish padres in 1776. 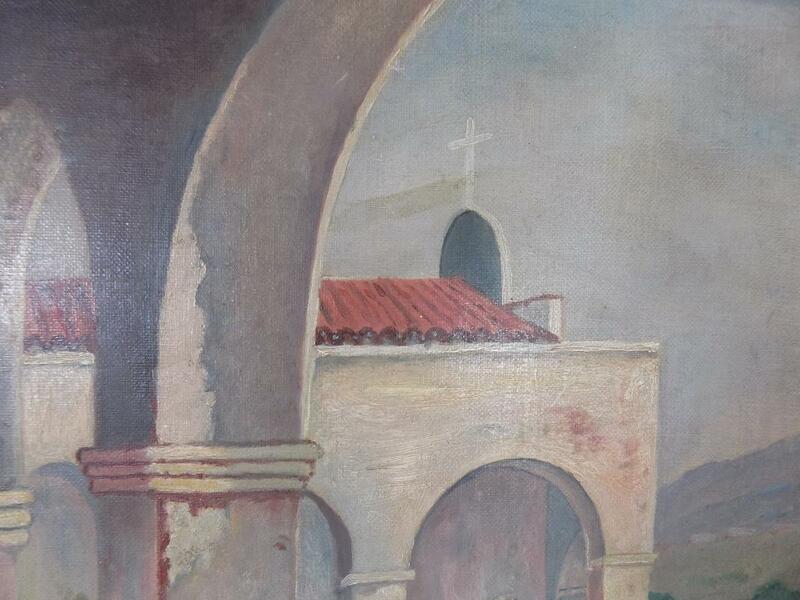 The scene depicts the mission as it was, before an earthquake destroyed the Great Stone church in 1812. The black and white photo we've included, courtesy of Orange County Archives, was taken in 1910 and shows the actual condition of the Spanish mission at that time. 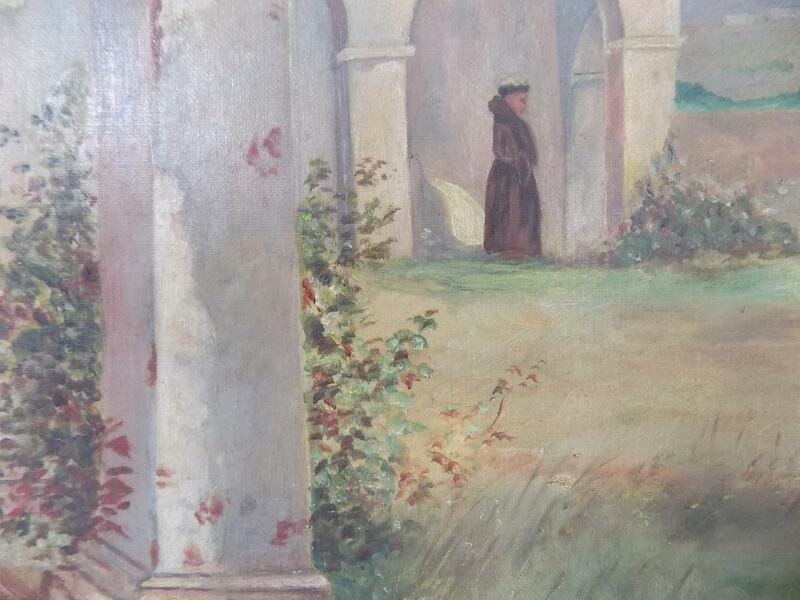 While named for St. John of Capistrano, a 14th century theologian, it was founded by Father (later Saint) Junipero Serra; possibly that's Saint Serra pictured walking to Mass in the background. The mission is, of course, famous for the Annual Return of the Swallows. The painting measures 20 inches by 25 inches framed; the sight size is 13 3/4 inches by 18 3/4 inches and the piece weighs 4 3/4 pounds. 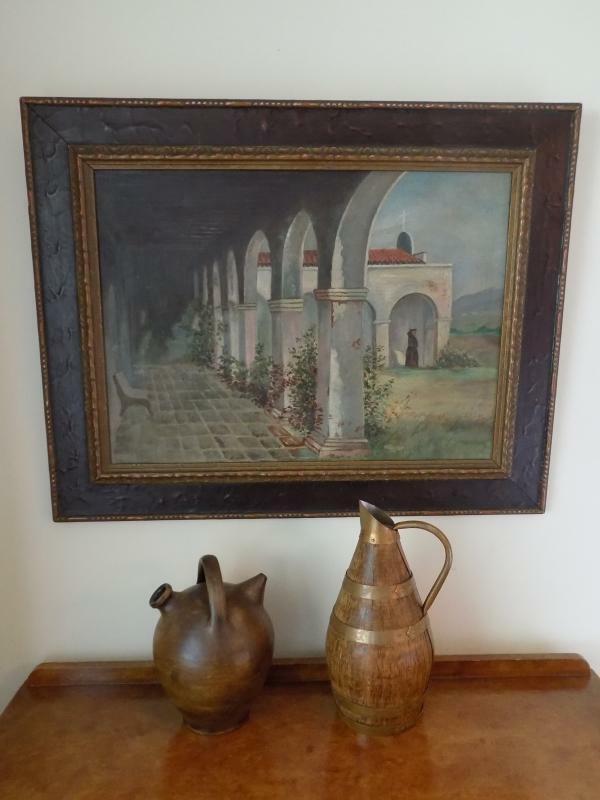 The wooden frame is beautiful, a late Arts and Crafts/Mission style (appropriately named in this case) with gilded beading around the outer edge, surrounding a 1 1/2 inch wide dark brown molding with relief designs. The inner filet features gilded raised carving of stylized petals surmounted with scalloping. The gilding is a combination of both a dark gold and a Roman Bronze. The canvas is wrapped around a flat, wide pine inner frame, rather than a narrow stretcher. 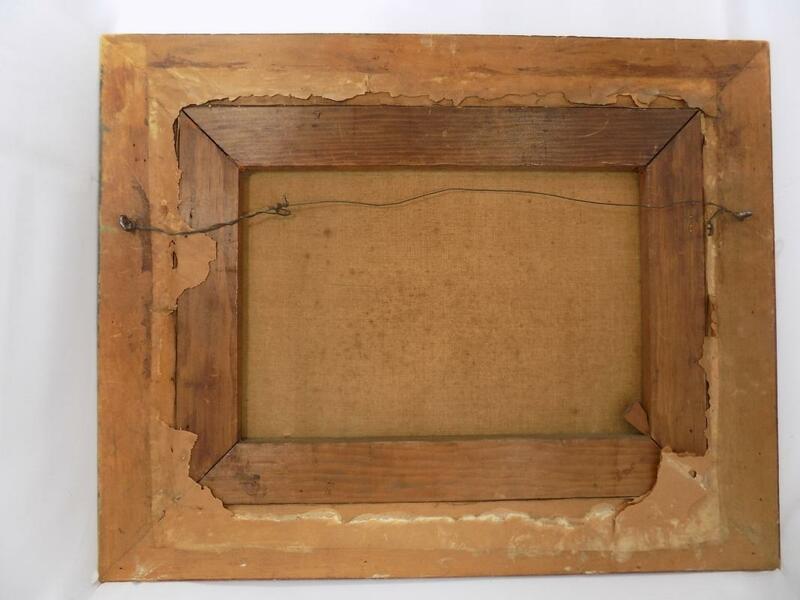 Both frame and painting are presented as found, with a torn dust paper on the back and an old hanging wire mounted to the frame with darkened screw eyes. 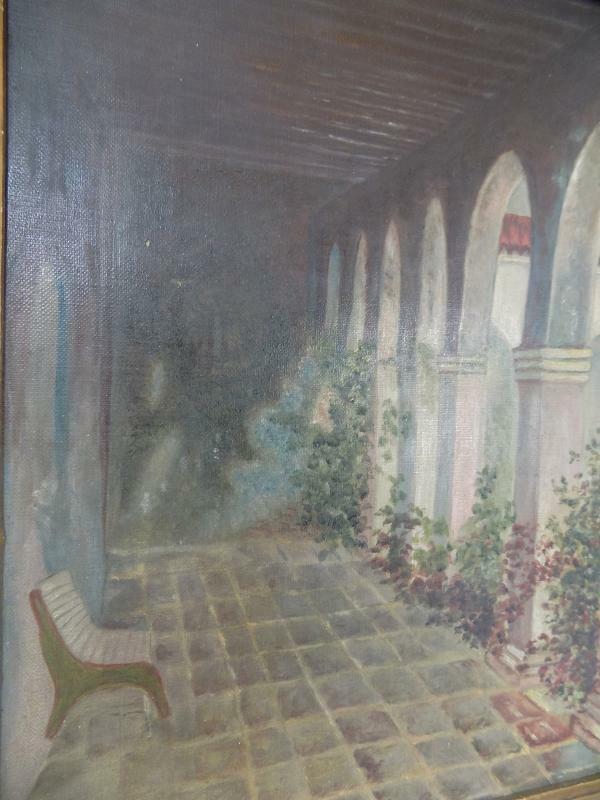 The painting and the frame are in very good condition, with no tears or cracks to the canvas and some nicks to the frame along the sides only. 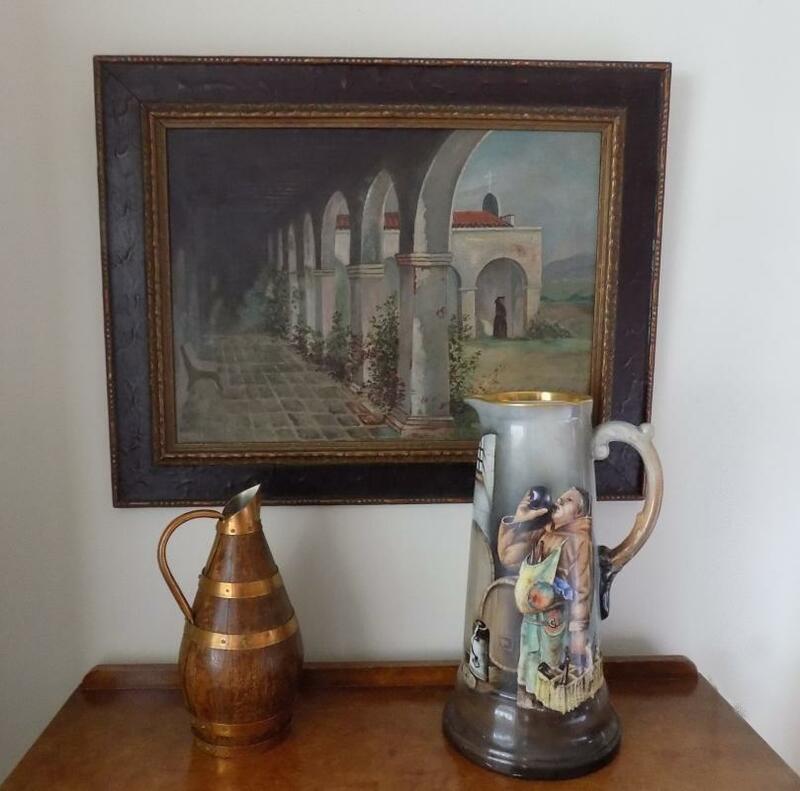 It's a wonderful artwork and a piece of California history.